Sour Cream Chicken Enchiladas, creamy and delicious, are the perfect not too spicy Mexican recipe that goes great with homemade salsa. 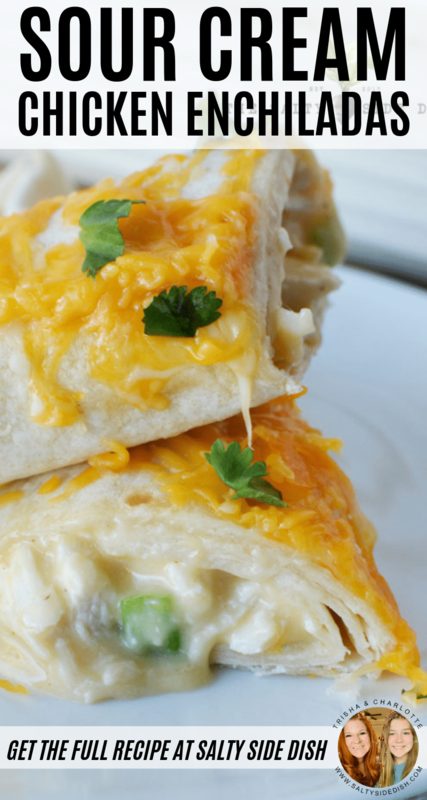 Simple and Easy, these chicken enchiladas are a perfect weeknight meal that is made in under 30 minutes, making it family friendly for busy nights. When it comes to Mexican recipes, they run the gambit of super mild to over the top spicy. Personally, I like a nice mild middle when it comes to my seasonings but my kids? They need incredibly child friendly and nothing over the top. That means our Mexican meals, when baked for a family, have to be either easily customization per plate or totally versatile in how we spice them. 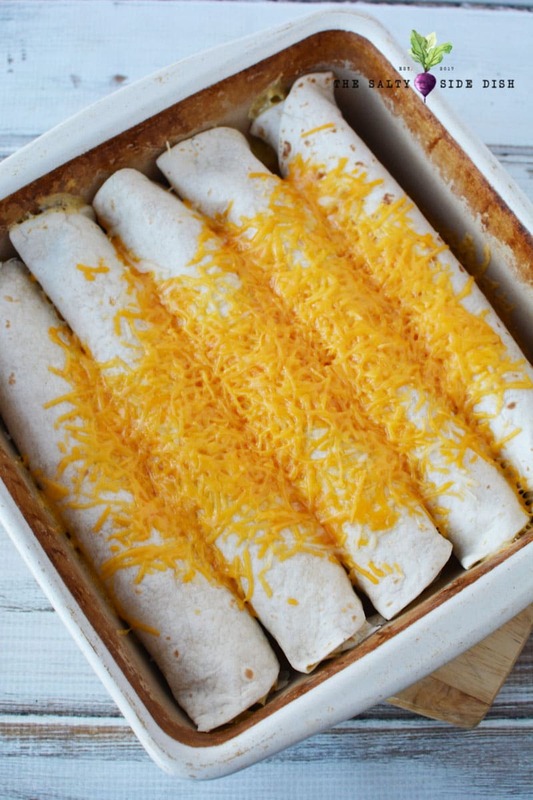 Now our salsa chicken and these super kid friendly chicken enchiladas do just that. 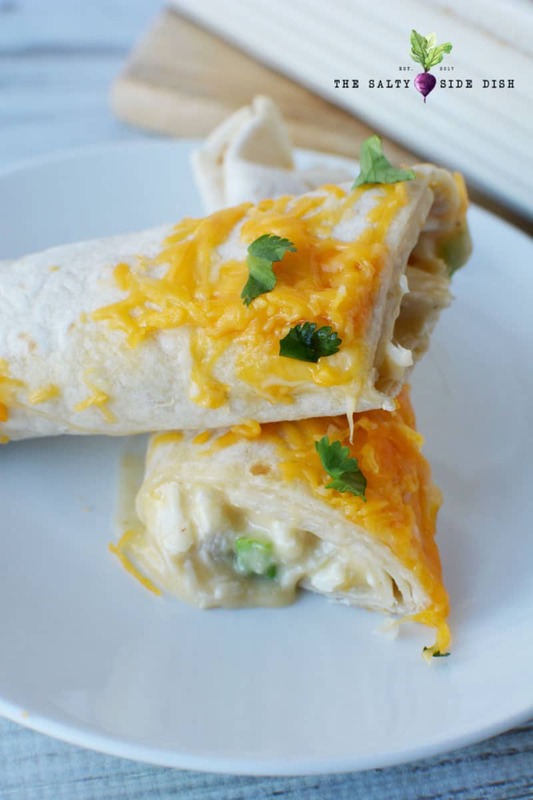 Skipping the jalapenos and green chilies and instead flavoring with cream of chicken soup, sour cream, and simple cheese make these the most family friendly low on spice enchiladas you will ever serve. You may notice that these enchiladas do not come with a smothering of white enchilada cheese sauce or even red tomato sauce. You can def make those and pour on top but my family likes to mix it up and instead top with our own salsas, extra dollops of sour cream, and black olives so for THIS particular recipe, we left the sauce off. And because the chicken enchiladas are less messy, you get a lot less complaining from your kids. Usually. Preheat oven to 350. 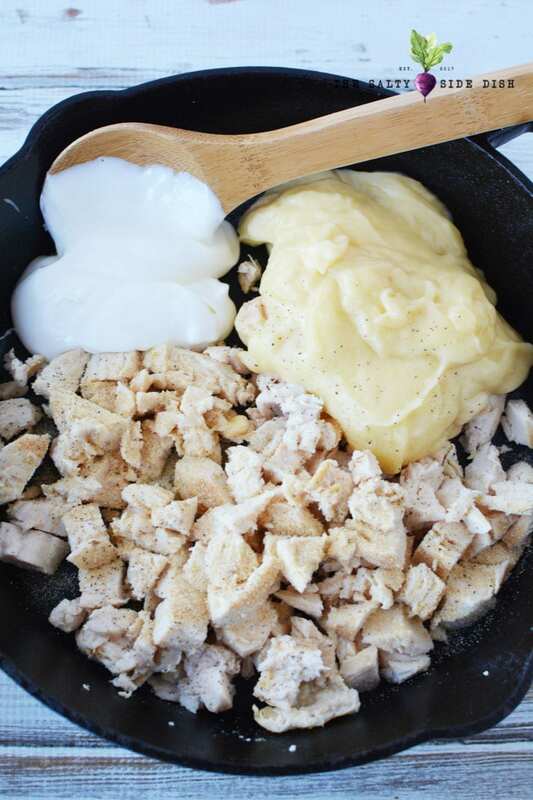 Lightly grease a baking dish with nonstick cooking spray. 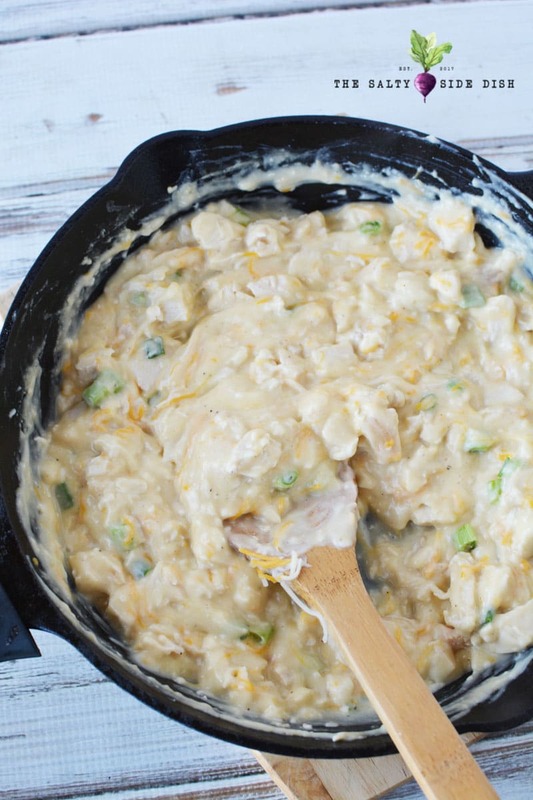 In a large skillet or saucepan, add chicken, soup, chilies, sour cream and garlic powder. Heat over medium heat for about 5 minutes. Stir in 1/2 cup cheese and onions. 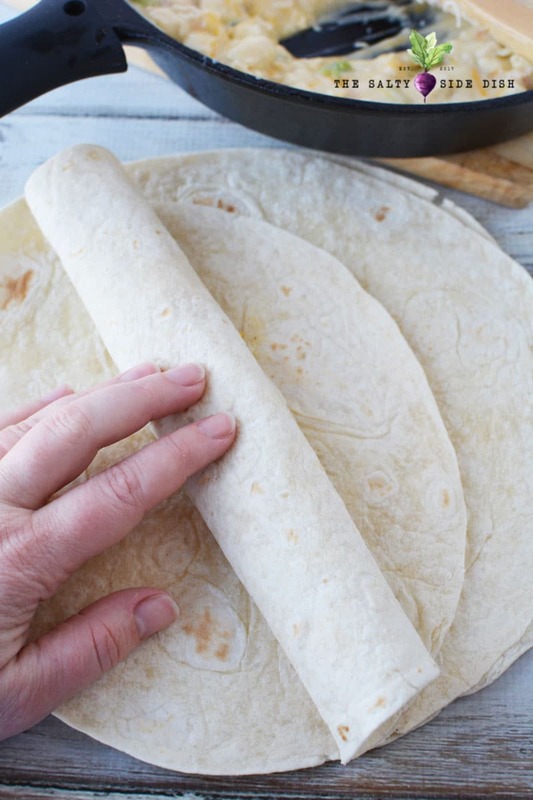 Spoon mixture evenly into 5 flour tortillas and roll up. Place seam of tortillas side down into prepared baking dish. Remove from oven, add remaining cheese and heat for an additional 3-5 minutes or until cheese is melted. You can get crazy with the cheese, but we don’t for photo purposes. Add fresh cilantro before serving. Also delicious to top with fresh homemade pico de gallo! Sour Cream Chicken Enchiladas, creamy and delicious, a not too spicy Mexican recipe that goes great with homemade salsa - Simple and Easy! 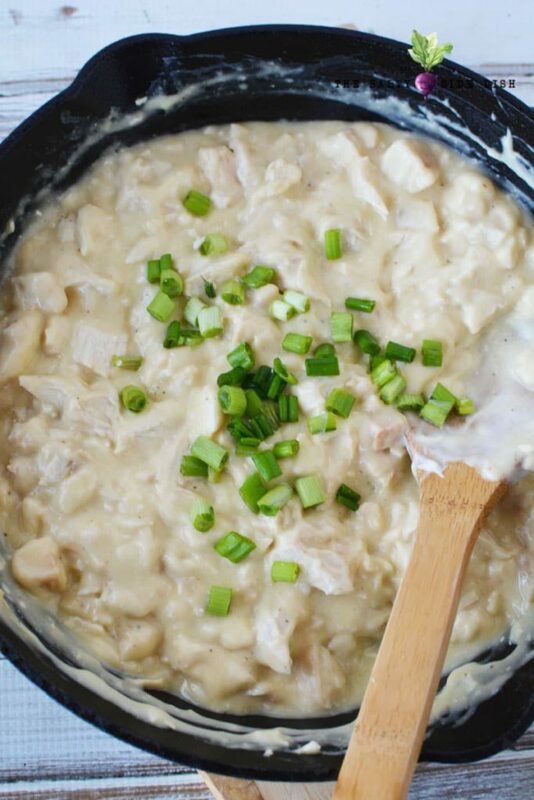 In a large skillet or saucepan, add chicken, soup, chilies, sour cream and garlic powder. Heat over medium heat for about 5 minutes. Stir frequently until heated through. Stir in 1/2 cup cheese and onions. 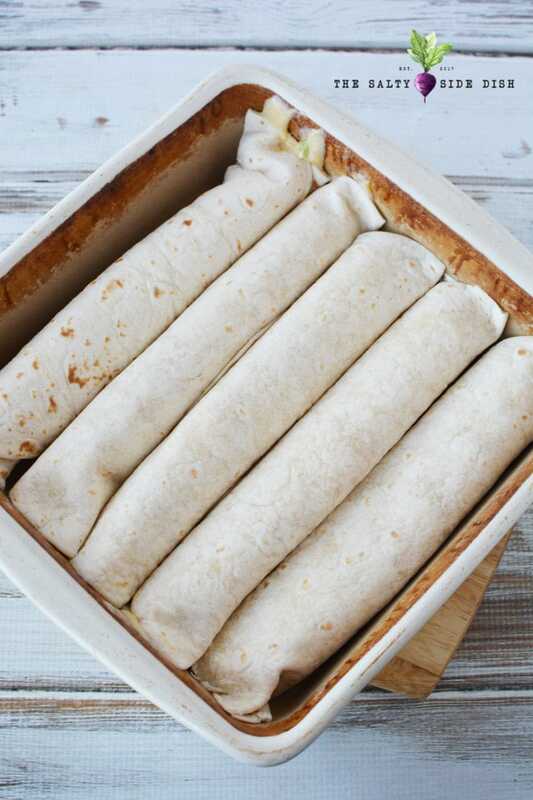 Spoon mixture evenly into 5 flour tortillas and roll up. Place seam side down into prepared baking dish. Bake for 10 minutes. Remove from oven, add remaining cheese and heat for an additional 3-5 minutes or until cheese is melted. Add fresh cilantro before serving. 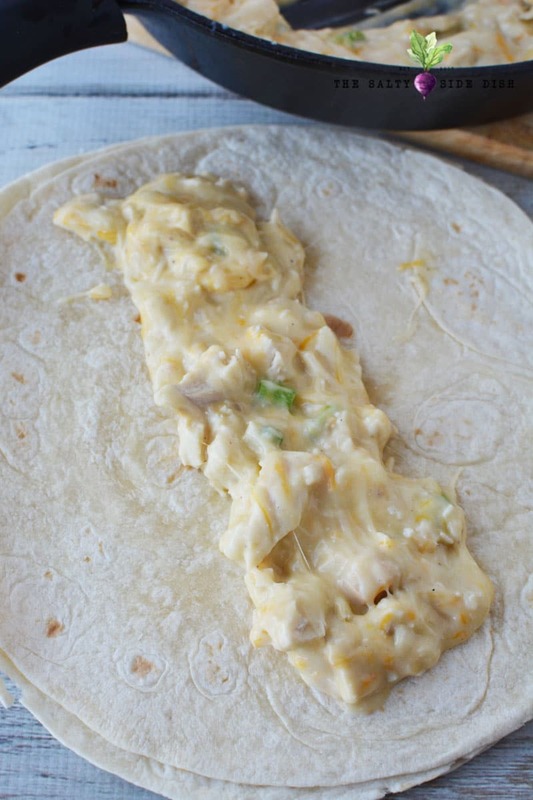 Do not forget to pin this recipe for later so you can come back and tell me what you think!